Long time no talk Blogger World! The Holidays are here, are YOU ready to tackle them on?! I was wrapped up with the final weeks of my Senior Fall Semester, and then my YouTube channel has been taking a bunch of my time, PLEASE FORGIVE ME BLOGGERS! :P But if you do want more daily posts, don't forget to follow me on Instagram and Twitter and definitely check out my YouTube account as well for vlogs, workouts, recipes, and tips! ANYWAYS, the Holidays are upon us! Can you believe Christmas is just a few days away?! Where has this year GONE! I can't believe it. The years keep going faster and faster and this year has probably been my favorite year to date. Why? Able to help a lot of people through emails/comments/personal training on reaching their goals and battling their hard times whether it be in reaching their goals, binge eating, under eating, etc. It's just been a GOOD YEAR <3 Now how can we end it off right, and still stick to our goals as much as possible?!? First and foremost, remember that the Holidays are a time to be enjoyed, spent with loved ones making memories that will last you a lifetime. It should be filled with joy, happiness, and NOT about obsessing over foods and every calorie or macro. ENJOY your time with family, but in order to do the LEAST amount of damage, try following these tips! Avoid extra sauces: so many dishes can be OVERWHELMED with sauces, when really, you can still get that flavor and taste with just a tablespoon of the same sauce! So go easy on the sauce, and you'll save bunches of hidden calories. If you can, put it on the side! That way you can just dip whatever food you have into the sauce, instead of it being slathered with an unnecessary amount! Workout and Stay Active: Hopefully you haven't given up ALL physical exercise during your Holiday Break and shenanigans! Remember, it's all about that balance! I find that I can indulge more in the foods I love, IF I make sure to stay active as well. You've got to have both! 30 minutes of physical activity is better than NONE, so don't say "Oh, I don't have time... " or "I only have time for 20 minutes..." THAT IS FINE. 20 minutes is better than 0 minutes. Download the Nike Training Club app and do a quick 30 minute circuit that will get ya all sweaty! Make sure to DEFINITELY workout the day of the actual feasts, that way you've burned off a bunch of calories to balance out the extra food you're (most likely) going to eat. Then the next day, make sure to do an intense total body workout to get all the muscles working, the sweat pouring, and the calories burning! If you have the excuse during your holiday break that you have nowhere to workout or can not get to the gym, then find home workouts! Again, the Nike Training Club App is great for that, as well as tons of workouts online that you can find for your home! If you're one to get lazy later on in the day, workout early! Get those endorphins running and that metabolism burning. This way, it's done with and out of the way and you have the rest of your day to do whatever you wish! HYDRATE with H20! Drink that water, and drink LOTS of it. Maybe you'll feel bloated that day, but your body will be getting in lots of water, aka peeing lots of water, and getting that water weight out! Don't weight yourself the day after the festivities: You WILL most likely be up a few pounds, but do not worry, it is just WATER WEIGHT. Not instant fat gains! Don't discourage or guilt yourself by stepping onto the scale and beating yourself up for what you ate. Just get back to your workouts the next day, and if you're intuitively eating, you may find yourself not as hungry the next day. Everything in Moderation: #MODERATIONNOTDEPRIVATION, that's my motto. Make sure to look over all the food choices before making your picks, and get a little bit of everything instead of a LOT of everything, this way you can get a taste of everything, zero in on your favorites, and then your next plate can be filled with that! That way you're not eating anything that is not as tasty and not "a waste of calories". Has that ever happened? Where you ate something that wasn't as delicious as you hoped and then you regretted eating it? Bahaha it's happened to me a few times! So make sure you're actually eating what you LOVE. It's ok to say NO sometimes! Don't be afraid of hurting someone's feelings if you reject their meatloaf or eggnog. This is your body and life and you don't have to eat what people tell you or do things that they tell you! If they say don't workout, be like "oh it's a quick 30 minutes!" or if they say you should eat this dish, you can respond with "Oh I'm full right now, but I may come back later for those __insert favorite food here____". It's not all about food: Remember, the holidays aren't supposed to be centered around FOOD FOOD FOOD. Interact with the people around you, engage in conversations, play in the games, be active with your family and friends, make some new amazing memories, take silly videos and pictures, play with the cousins, nieces and nephews, run around outside with the family pet, have a fun outdoor day and then cozy up by the fire at night, don't obsess yourself over the food that you want to eat or the foods that you feel you can't eat. Put that on the back burner. Yes the food is a great part of the holidays and everyone gathers to enjoy great meals, but the most important part is just BEING with the people around you and enjoying the time with them. Don't forget that! 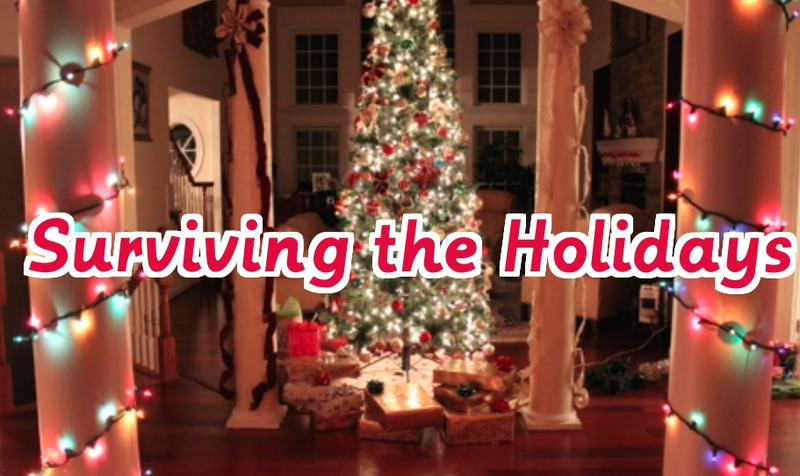 I hope these tips helped out somewhat with your "Surviving the Holidays" fears!